So, if you’ve been following me for a while, either on here or instagram, you will know that fitness is something I’ve really been enjoying this last year, and Sunday was my first day back after my summer holiday! Cardio is something I have always struggled with, my breathing never matches my exercise, so I find it really hard to keep the pace I want and finish a run. 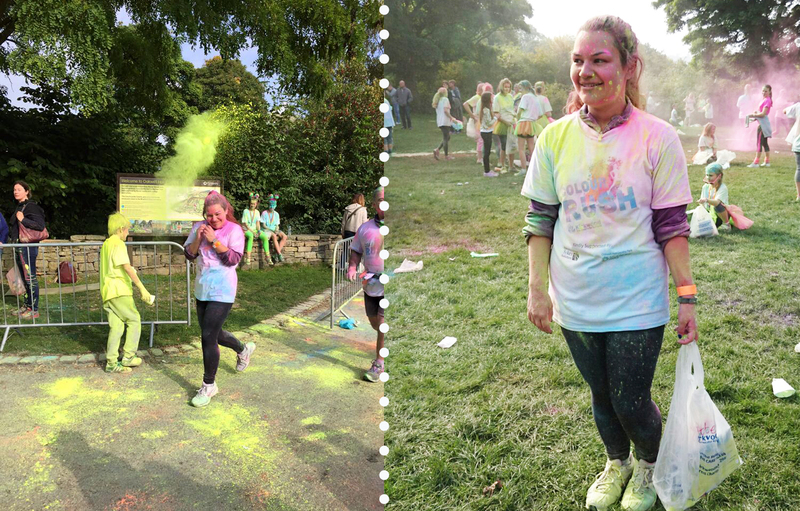 Despite this I set out Sunday morning to complete my first ever 5K Colour Run, in aid of my local hospice. I signed up with my dad on Thursday night, and was very excited to do such a fun run. On the day I put on my favourite gym leggings, a long sleeved exercise top (which apparently seems to be 2 sizes too big now, whoops!) and my old Nike trainers. 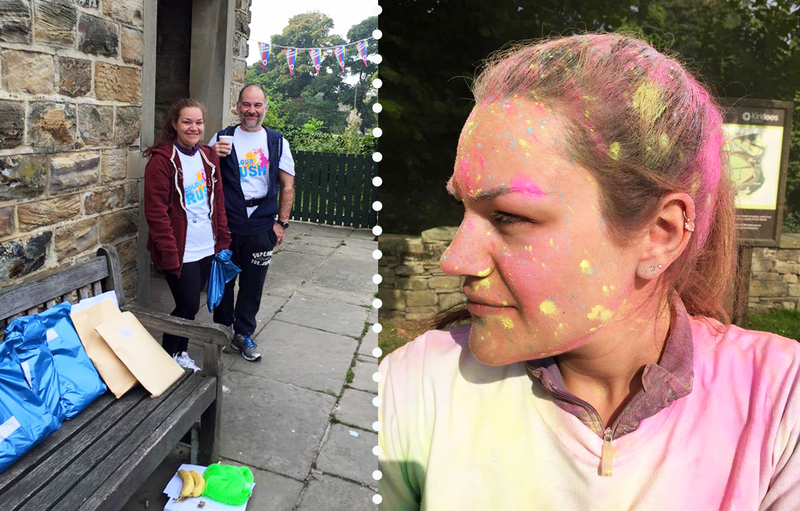 The run started at 10:30, but we made sure to get to the venue early where we picked up our packs which included our ‘Colour Rush’ tops. Before setting off everyone gathered in a field, threw some paint around and did a fun Zumba warmup. 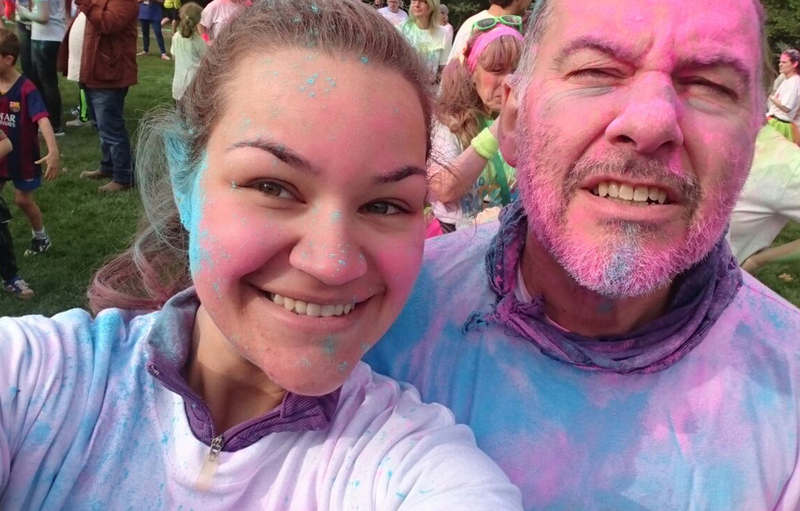 My dad and I made sure not to put too much paint on as we knew we’d get covered on our way around! The route was very picturesque, running through walking tracks and small bridges made for a nice change, however having to do a few cycles of the route made it somewhat confusing. Everyone was in such good moods and the kids loved throwing the paint around! I really loved doing this, and it has made my mind up to get a personal trainer and better myself when it comes to cardio. I hope to take part in many more, and if you’re wondering about giving them a go you really should! !